During the 2011 Luxury Travel Expo in Las Vegas, four travel professionals were selected as leaders in their respective travel segments and received the “Leaders in Luxury” awards from show presenters Travel Agent and Travel Advisor magazines. Ruthanne Terrero, vice-president and editorial director for Questex Hospitality + Travel Group commented that each recipient truly embodied excellence in luxury travel and showed by example how dedication to the industry led to future success. “Tours” was won by Greg Tepper, president of Exeter International. Nicholas Clayton, president of Viceroy Hotel Group won for “Hotels.” Viceroy distinguishes itself by designing each hotel uniquely for its market. 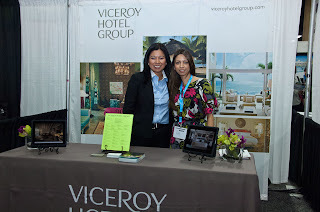 Last year they added their latest hotel - Viceroy Maldives to their world-wide collection of properties. Gary D. Davis, president of All About Travel, Inc. won the “Travel Professional” award. The “Cruise” award was taken by Richard Sasso, president and chief executive officer of MSC Cruises. MSC is now the fourth largest cruise company. Sasso founded the idea of “a ship within a ship” concept called the MSC Yacht Club, where passengers can enjoy exclusive access and privileges, yet still have access to the remainder of the ship’s activities when desired. Yacht Club members enjoy butler service, luxury suites, complimentary wine and spirits and private dining, lounge, pool and bar. Editors of Travel Agent and Travel Advisor magazines selected the winners from a field of 16 finalists and presented the awards during a special ceremony at Mandalay Bay Hotel and Casino.